Just when you think a manufacturer has exhausted bringing back all the special editions of one of its most vaunted models of years gone by, up springs another one. So, just after Ford announced a new Bullitt Mustang was imminent to celebrate 50 years since the Steve McQueen movie made such a star of that green Mustang fastback, now another blast from the past is on its way. 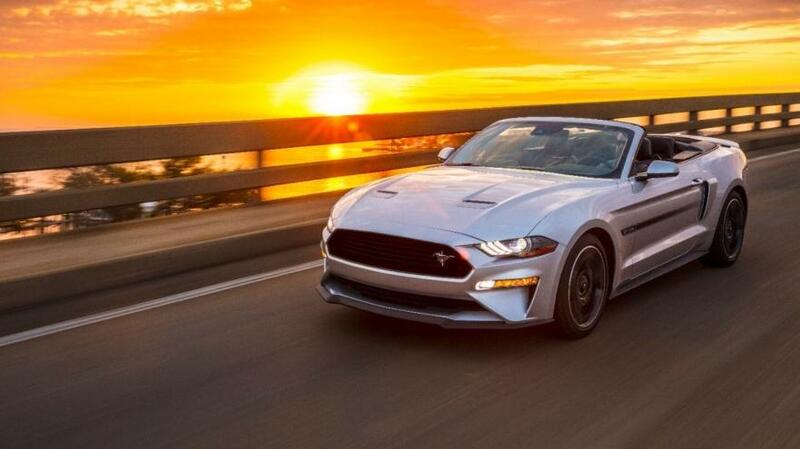 The model in question is none other than the 2019 Ford Mustang California Special, which dates back to 1968 when the original was also known as the GT/CS. Even when the Mustang was a fledgling sports car model in the Ford portfolio back in 1964, it wasn't long before owners clubs and regional dealers all around the country started coming up with their own personalized versions of what is now one of America's greatest auto icons. One of them was inspired by the 1967 Shelby GT notchback coupe prototype, and it eventually came to be known as the California Special. Originally featuring a blacked-out grille, fog lamps and a side racing stripe that ended ahead of a new rear fender scoop, the first Ford Mustang California Special also boasted a Shelby-inspired spoiler, custom taillamps and twist-lock hood fasteners. Impressed by what it saw, Ford decided to go right ahead and put a limited number of these California Specials into factory production for 1968. Not long after it was launched, the California Special quickly joined the likes of Shelby, Boss and Mach 1 as legendary special-editions of the Mustang. Any 2019 Ford Mustang GT will be a highly desirable car, but the 2019 California Special is going to be a visual standout Mustang with performance to match its fabulous looks. One of the first things onlookers will notice is the trademark fading stripe that traces from the 5.0 badge on the side of the car to the rear fender scoop. Then there's a signature Ebony Black and Race Red script California Special badge gracing the trunk lid, and at the front there's that blacked-out open grille and the Mustang Performance Pack 1 splitter. The California Special comes wearing a set of five-spoke painted machined wheels that are unique to this particular model. The custom theme continues to the interior where the rich black Miko suede-trimmed seats are embossed with GT/CS insignia and feature fetching contrast red accent stitching, and the look is further enhanced by custom embroidered GT/CS floor mats. The signature California Special script badging also appears on the passenger-side dash panel. Such stunning looks deserve performance to match, and that's certainly not a problem here. Under the hood is the Mustang GT's legendary 5.0-liter V-8 engine that in this case develops 460 horsepower and 420 lb.-ft. of torque. The performance credentials are further enhanced when you have the available Performance Package thanks to advanced rev-matching, which smooth out shifts by first predicting shifts before quickly matching engine rpm in a similar way to the heel-and-toe method used by the professionals. This sensational car also features a class-exclusive quad-tip fully variable active valve performance exhaust, a world-class Bang & Olufsen PLAY audio system, and the opportunity to personalize more than ever thanks to exciting new vintage-inspired colors such as Velocity Blue, Need for Green and the iconic BULLITT model’s exclusive Dark Highland Green. 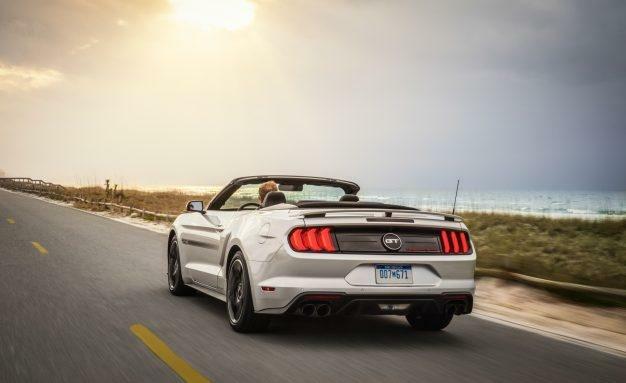 For more information about pricing and availability of the superb 2019 Ford Mustang California Special, get in touch with us here at Southern California Ford Dealers and be at the front of the line for a test drive.